Taken from Mary Mitchell's personal collection of over 1,000 fashion illustrations, the Drawn to Fashion exhibition from 1/28/12 to 5/27/12 at Omaha's Durham Museum will educate visitors about the lost art of fashion illustration. The centerpiece of the exhibit is 150 original images from local fashion illustrator, Mary J. Mitchell, whose work brought to life the promotional efforts of such well-known Omaha clothiers as The Nebraska, Topp's, Goldstein Chapman, Herzbergs, Zoobs, and many others. A collection from the 1000+ Fashion Illustrations from 1970 to 1990 plus Mary's current work. 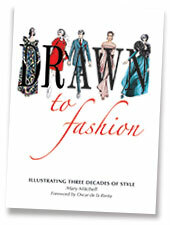 Proceeds from this book will benefit the Mary Mitchell Fashion Illustration Scholarship Fund at the Textile, Clothing and Design Department at the University of Nebraska-Lincoln. A scholarship fund honoring Mary Mitchell's amazing career in fashion illustration has been created at the University of Nebraska Foundation. Scholarship recipients will be Textiles, Clothing and Design majors specializing in apparel design at UNL. "Fashion Illustration has always been an important part of the Bazaar tradition: from the early days when all the fashions were hand drawn, to the legendary covers designed for us by the likes of Erte and Jean Cocteau, to today's contributions from artists like Karl Lagerfeld and Ruben Toledo. I love that Mary Mitchell brought such a high caliber of artistry to the local level. I was in fashion school in London in the 1980's, but when I look at the work Mary drew for the women of Omaha at that time, her level of detail puts me right into the moment. To the casual viewer, Mary's work appears effortless. But when you look more closely, you see the precision and intention behind each brushstroke. She elevates each drawing to a tactile experience. A picture may be worth a thousand words, but a Mary Mitchell illustration is worth a thousand rustles of silk and crisp snaps of tweed."